So you’re ready to start a website for your business, but which one is the right one for your company? Here are 3 common types of websites you can choose from – Informational, E-commerce, and E-catalog. Each of these types of websites serves a different purpose and idea. Whether your business lies within the industry of fashion, law, medical, food, media, etc. your website can be categorized into one of the three types. To differentiate among these categories, and to better understand which type of website is best for your business, keep on reading to learn more! Clear communication. That’s what informational websites are intended for. These websites are for businesses to display their company background, history, and services and get visitors to take action. The main purpose of any informational website is to simply show what you can offer to your customers, and to convince them to purchase your services by generating a lead on the website. It can also be used as an advertising/marketing tool for your business as well! As you can see in the picture above, these 3 websites represent informational websites. 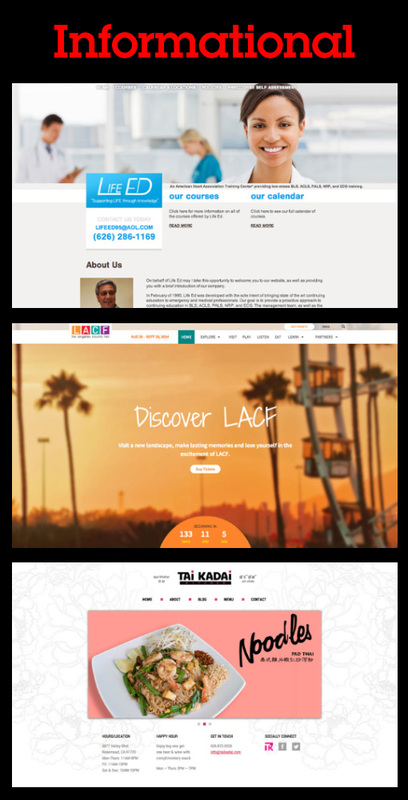 One of the larger informational websites we’ve developed here at Ready Artwork is the LACF (Los Angeles County Fair). It displays their hours, location, events, food, entertainment, etc. It’s a way to show their customers when to expect certain performances, how to plan their visit, and how to get the most out of their trip. Two words – shopping cart. E-commerce is also known as electronic commerce, which basically means that this website has an online shopping cart where you are able to purchase services or goods. 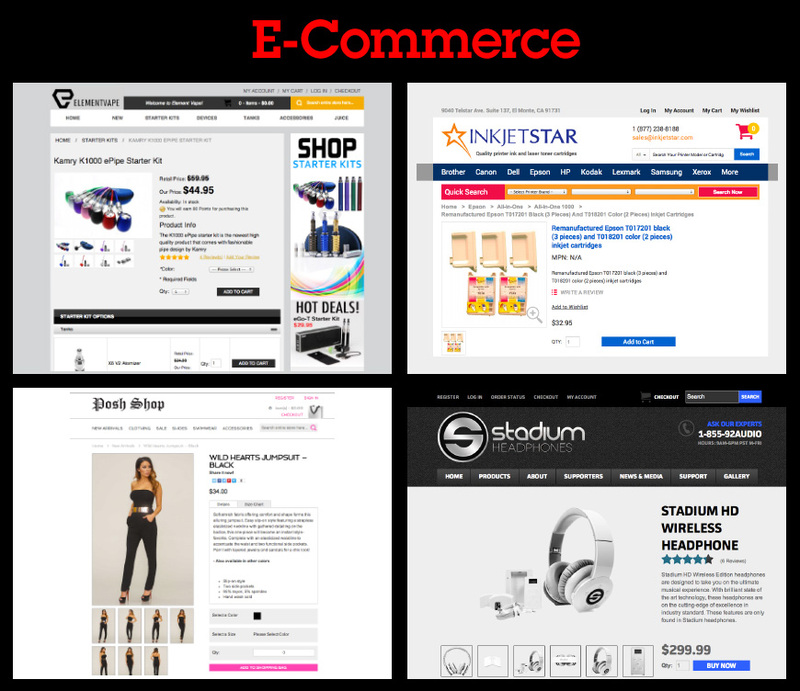 Based on the example to the right, it shows 4 different types of e-commerce websites ranging from fashion, electronic cigarettes, to printer ink and headphones that Ready Artwork has built. They all have a shopping cart feature where customers are able to input their billing and mailing address as well as their method of payment. E-commerce websites have expanded vastly over the past few years and have become increasingly more popular. You are able to purchase merchandise/products from the comfort of your living room and expect packages in a short amount of time. If you have products and want to sell them online to your worldwide customers, an E-commerce website is the way to go! An electronic catalog is a supplement, or in some cases, a replacement for the traditional printed catalog where buyers can view a company’s entire product line, e-catalog websites do not have live shopping features. Typically, manufacturers, importers and wholesalers are the type of businesses that can maximize the usage of an e-catalog. Once the buyers are interested in the products, they would use a contact form to express their interest to the company. Customers can fill out a form on your website and you will then process the order offline. An e-catalog website allows you to showcase your products online with the option of hiding or revealing the price of the item. You can choose to display the features, specs, pictures, and even downloadable forms if needed. Now that you have learned the differences among informational, e-commerce and e-catalog websites, are you ready to get started with yours today? Contact us today and give us call at 626-400.4511. One of our sales associates will be sure to help you! Or, if you would like to browse more examples, check out our portfolio page!